Have a trailer that you would like to repurpose? Or a lightweight trailer that needs a little beef? Is it practical to strengthen an existing trailer? Sure, there are several ways to increase trailer load capacity, and in the spirit of DIY, here are some tips to accomplish it. When discussing needs to strengthen a trailer, there are two different needs that come up. The most common is a trailer that flexes too much or feels a bit rickety. The other is a genuine need to increase trailer load capacity. Both of these reasons for beefing up a trailer are perfectly legitimate, but the approaches are a little different. In this post we’ll look at increasing load capacity — so the trailer can safely carry more. Check this other post for ways to stiffen and strengthen a trailer frame so it “feels” stronger or more solid. Then read about Safety Factor in materials selection. These three topics are related, so you might want to read them all. What Is Trailer Load Capacity? Every trailer is rated by the total weight it is designed to handle. This rating is the Trailer Load Capacity. Technically it’s GVWR (Gross Vehicle Weight Rating) which includes the total trailer weight plus the load. Though it’s a little simplified, we’ll use GAWR (Gross Axle Weight Rating) — which is the combined axle(s) load capacity — and call it the total trailer load capacity. It’s really not that complicated. Basically if you have a 3500 pound rated single axle, then for our purposes, that’s the Trailer Load Capacity. If the trailer weighs 500 pounds, then the maximum payload you can carry is 3000 pounds. If you’re really into it, then sure, dive into tongue load and other tidbits. For this post, that’s not really the purpose. Portion of a Base Trailer Frame for Examples Below. There is a lot that goes into making significant trailer load capacity increases — like from 1000 pounds to 2000 pounds, or from 3500 pounds to 5200 pounds. Also, it can be expensive. Yet, it is definitely possible, and there are definitely needs to do it, so we’ll talk about two solid approaches. Before diving into the two approaches, let’s talk about components. The trailer load limit is the capability of its weakest portion. We can strengthen the frame, yes, but we must also upgrade the load bearing components — axles, springs, hitch parts, tires, jacks, safety chains, etc. Don’t forget the hitch parts, and tongue jack. For our purposes, we’ll talk about a single axle, but the same applies to multiples. Since trailer load capacity is defined by the axle(s) combined load rating, you will you need an axle upgrade. So, ditch the whimpy one, and buy another that meets your new load capacity requirement. Sometimes that also means removing the spring hangers and replacing them with stronger ones. Next, we look at strengthening the main trailer beams and cross members. There are two approaches. A First Approach is to weld strengthening material on top of the existing frame beams. We call it Stack addition. A simplified look at the engineering says that strength of a beam goes up as the distance between the top and bottom “fibers” (and mass) of the beam increases. We see this easily as we compare a 2×3 rectangular beam with a 2×4 rectangular beam. Even if the wall thickness of the 2×4 beam is a little less than the wall thickness of a 2×3, the 2×4 is stronger. Note that Beam 3 is both stronger and lighter than beam 2. 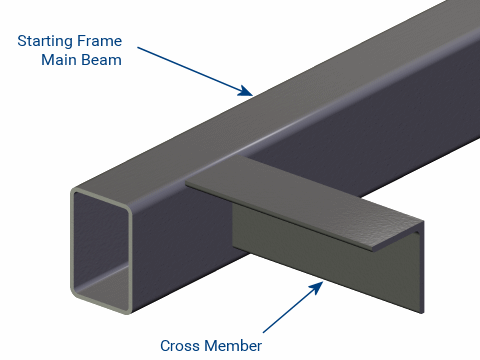 All beams are Rectangular Steel Tube, 10′ Length on Simple Supports. Theoretical Max Center Load Based on 36ksi Yield. Weight in Lbs for 10′ Beam. From this table it’s easy to see that increasing “height” has a much greater effect than increasing thickness. So that’s the principle, how do we apply it? For the situation of wanting to strengthen an existing trailer frame, we can simply increase the “height” of each beam by adding material to the top of each one. There is a lot more to this discussion about beams. Things like choosing the right beam shapes and the different situations for areas and loads of the trailer frame. Let’s say your existing trailer uses 2×3 rectangular beams on a 2000# trailer. 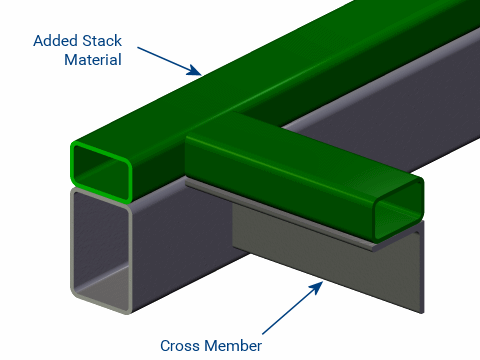 Let’s say it uses angle for cross members as shown in the Base Frame image above. To apply the stack strengthening members, weld for maximum advantage. However, you don’t need to weld full length — just stitch welds every few inches on both sides where the beams contact. Please Note: The numbers here are for reference, and though they could work in some situations, they won’t work for all. DO NOT just add material to strengthen a trailer frame and think it’s enough without doing the calculations. Beam loading calculations and equations (like these) are in many places on the web, so take time to figure it out and do it right. 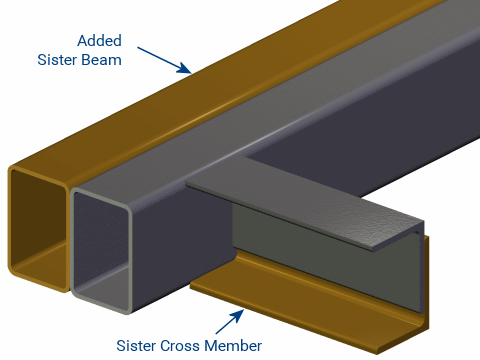 Adjust cross members in the same way — both to strengthen them and to match the new height of the main beams. Not the method shown in the image. If this approach is possible, it is also preferable. This approach will increase strength for trailer load capacity while minimizing the cost and weight required to do it. An example of this approach, is 0n the Customer Stories page. A man named Alan beefed up his flatbed trailer to haul is tractor with this method. For a more analytical information and a very practical example, see the post on Tips for Mounting Trailer Axle Springs. A Second Approach to strengthen a trailer frame is to “sister” the beams. Weld a new beam next to the existing beam, which may be easier to say than to do. For a simple rectangular trailer, this might increase the width a little, so note that the new axle may also want a wider spring seat dimension. Note where the tires are, and where other components interact. Use frame sistering beams of at least the same capacity. Going back to our example, if your trailer uses 2×3 rectangular beams on a 2000# trailer, sistering all the beams will roughly double the trailer load capacity — to 4000#. That fits the objective. This, by the way, is a great way to handle cross members when widening a trailer frame with the split method. Again, cross members need it too. Either add in more cross members, or sister them. Don’t forget, you can sister beams up-side-down as illustrated for an even stronger effect. In both the above approaches the trailer ends up with a higher load capacity as desired. There’s work involved, but unless your trailer has some real complications, increasing the trailer load capacity is pretty straightforward. Torsion Axles: Another case for strengthening a trailer frame is converting from a leaf spring style axle to a torsion axle. Torsions apply additional stresses to a trailer frame (as illustrated with this analysis), so one of the above approaches will make the conversion great. Oh, and the strengthening members do not need to run full length. We recommend only a couple feet in front and behind the torsion axle center. One final thought. In both ways, the trailer will end up heavier than it should for its new capacity, and with all that work plus the expense of new stronger components (axles, couplers, etc. ), it makes looking at building something — a new trailer frame (perhaps using some of the existing components) — a little more attractive.